This rare mirror was made within the Mughal empire, probably towards the end of the reign of the emperor 'Alamgir (r. 1658-1707). 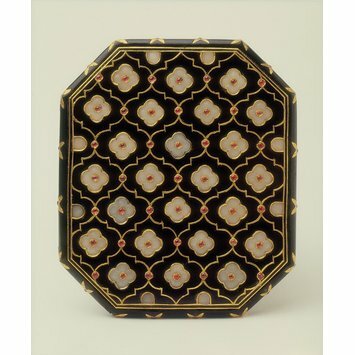 The mirror is held in a frame of dark green nephrite jade inlaid with white nephrite jade and rubies in gold. The inlays on the mirror-back are secured by highly refined gold to form a trellis design. It was formerly owned by Colonel Charles Seton Guthrie, who sold it with other objects from his renowned collection of Mughal and other hardstones to the Indian Museum in London in 1868. These were transferred to this museum in 1879. Dark green nephrite jade inlaid with white nephrite jade and rubies in gold. 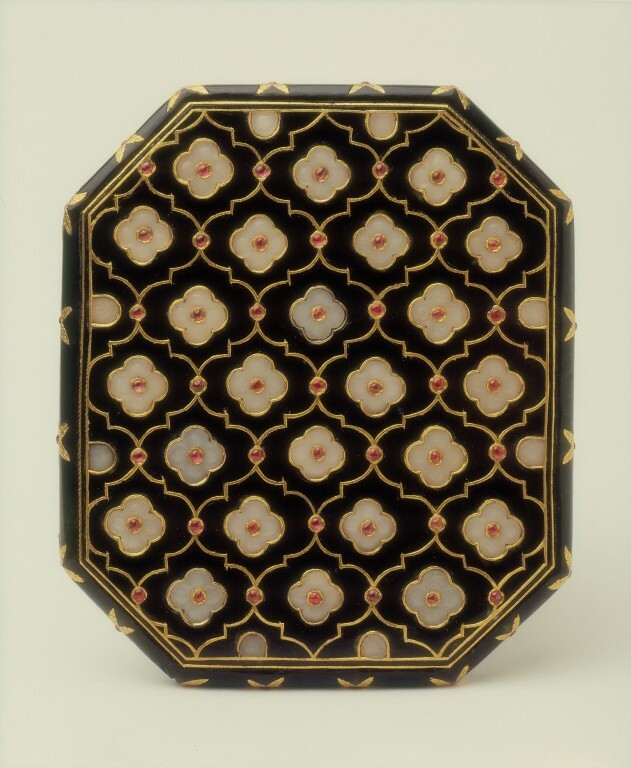 The inlays on the mirror-back are secured by highly refined gold to form a trellis design. Purchased from the collection of Colonel Charles Seton Guthrie in 1868 and transferred from the India Museum in 1879. Baker, Malcolm, et. al., A Grand Design: The Art of the Victoria and Albert Museum, London: V&A Publications, 1999.